Game Day Preview Canucks at Capitals: Can the Canucks Capitalize? The Canucks have already met and beaten the Capitals once this season, can they do it again without Kesler? The Canucks won their last game against the Winnipeg Jets last Wednesday. Alex Burrows not only scored his first goal of the season, but he scored twice. Wait, aren’t we supposed to be tanking? 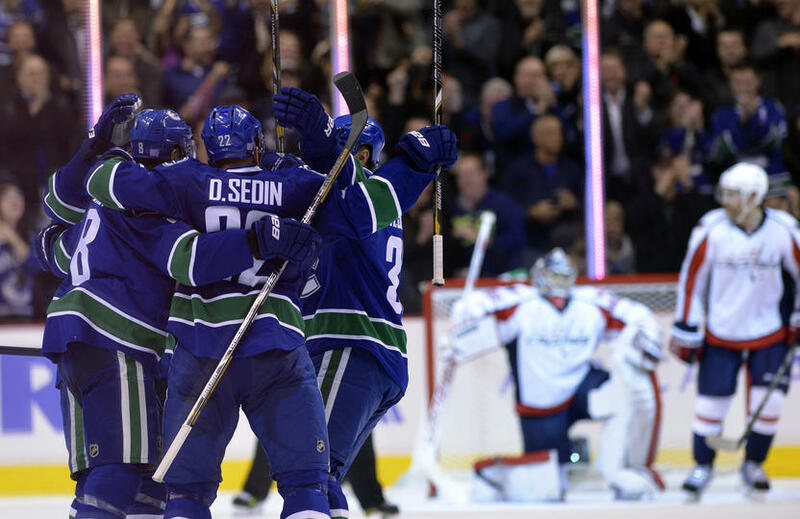 The playoff race continues tonight for the Canucks as they face a similarly-desperate Washington Capitals team. Both the Canucks (30-28-10) and the Caps (30-27-10) have 70 points, good for 10th place in the Western Conference and 11th place in the Eastern Conference, respectively. The playoff door hasn’t shut completely for either team, but unless they can string together some a lot of wins, it’s surely about to close pretty quickly. While it’s been a disappointing season overall for the Caps, Alex Ovechkin at least is having another good season. He leads the league with 44 goals; meanwhile, on the other side of the ledger, the Canuck’s big 3, Henrik Sedin, Daniel Sedin and Ryan Kesler have combined for 45 goals all together. Not that this matters much tonight with Danny and Kes both out with injuries, but the stat kinda makes you cringe, eh? Zack Kassian is back tonight after serving his 3-game suspension. Well, we hope so anyway. With 2 goals, 6 shots and 5 hits, Burr is coming off what is easily his best game of the season. Maybe with the proverbial monkey off his back now, let’s hope Burr is back for good. It sounds like Kes suffered a sprained knee from Jim Slater’s knee-on-knee hit last Wednesday and will miss a couple of weeks. The injury looked a lot worse when it happened. That he’ll be able to come back for the last couple of weeks of the regular season is good news or bad news, depending on which side of the “should the Canucks tank” you fall on. With Brad Richardson out as well, we may be looking at a lineup with Hank, Shawn Matthias, Jordan Schroeder and Zac Dalpe down the middle.